Global Test Market is a fast way to make money online. It rewarded USD $30 million+ to their worldwide members in 2016. The panel removes the hassle so you can focus on giving your opinions and getting rewarded. Tell them what you think about the products you use every day or even try new ones before they hit store shelves! With GlobalTestMarket your ideas really do make a difference. Also read about Ormax Online Surveys Panel to Earn Free Flipkart and Bookmyshow Gift Vouchers. Earn rewards for taking paid surveys. Surveys are a fun way to learn something new. FREE to join. You will earn Points from completing most of our paid surveys that you can then redeem for rewards. NICEF charity donation. Selection of rewards will depend on your country of living. Start earning Points by completing our online surveys! 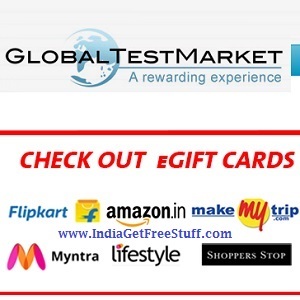 Visit here to make an account at GlobalTestMarket. It’s free to join. Secondly, enter details like Gender, Name, and Email Address. Click “Get Started”. On the next page, enter your home address and date of birth. On next page, you will see a message: “Check your inbox! Thank you for joining GlobalTestMarket. You membership registration is almost complete. Activate your membership via the link sent to you via email. Complete your profile surveys regarding health, lifestyle, household, interests etc. These make you eligible to get surveys. After that you will get paid surveys notifications from Global Test Market from time to time via registered Email. GST gives LifePoints for every online paid survey you complete. Once you’ve earned enough LifePoints, click on the Redeem button on the Rewards Page. Select and redeem your reward out of many items like gift cards, e-certificates and charity donations. One of our readers has got free Flipkart egift voucher worth Rs.300 today.